I picked this book because I love reading anything and everything about witches and witch trials. Also it’s set in 17th century Scotland which is just icing on the cake. The Witching Hour is not about witches or witch trials entirely though. It’s about a girl called Maggie who lives on the Isle of Bute with her grandmother who is bitter and angry with life and all that fate has done to her. She can’t help but turn all the hate on the neighbors and the people around her. When one of the new-born dies, his father accuses Maggie’s grandmother of witchcraft and since most of the people don’t have very high opinion of her, she is branded as a witch and burned. Maggie would have been burned too if not for Tam, a family friend. Maggie manages to run away to her dead father’s brother who lives with his family in Ladymuir. Although he welcomes Maggie in his house and family he has his own problems to deal with. It’s the time when the King wants to replace God in the churches of Scotland and establish himself as the supreme leader. But many people, including her uncle’s family, is opposed to it. They have their secret meetings and sermons. When the King’s men arrest people from the town who have not been co-operating with the King, all hell breaks loose. Maggie has to leave her safe heaven and embark on a journey and put everything she has on risk. There are a lot of things I loved about this book. First and foremost is the setting. The author Elizabeth Laird describes the time and the place so beautifully that you can’t help feel like you’re actually there experiencing it all with Maggie. I loved the Island of Bute and loved traveling with Maggie across Scotland. It’s as good as it gets where traveling via fiction is considered. I also loved Maggie and how she learned from the mistakes her grandmother made, and how even though she necessarily wasn’t always righteous, she had a good and brave heart. I learned a lot of things about Scotland that I didn’t know before and although I don’t really understand all the religious details and intricacies, I had a good time getting immersed in the story of Maggie. It’s a Young Adult book but it’s also a book which adults can enjoy thoroughly. The Witching Hour goes way beyond a teenage girl’s story. The only thing I didn’t like about the book was the length. There were a few dry spots in it and I guess it would have worked best if the book was cut short by a few pages. But other than that I heartily recommend this book. 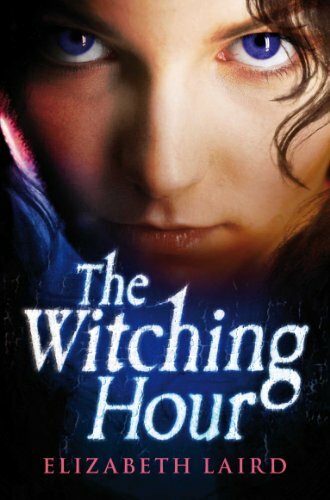 Note: The Witching Hour is releasing in the U.S as The Betrayal of Maggie Blair in April 2011. This entry was posted in Books, Books read 2011, Reviews, Scotland, Young Adult and tagged elizabeth laird, scotland, the betrayal of maggie blair, the witching hour. Bookmark the permalink. Wow, I love eerie books set in Scotland – such the perfect setting for them – so I think I need to check this one out! I have to admit that I have never read any YA fiction before and I don’t really know why. I was very surprised that this title is classified under children’s books, but it is definitely one that I shall be adding to my wish list and perhaps will be a genre that I shall read more often after your recommendation, thanks. Ooh, great review, Violet. Like you, I also love anything to do with witches and witchcraft – especially when they’re set centuries ago. 😀 I will definitely be checking this one out. It looks so good. I have a fascination with witches too. This one sounds good, Violet!